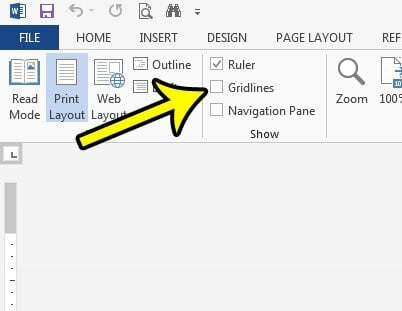 If your blank Word document is displaying a pattern of vertical and horizontal lines all throughout the document, then you might be looking for a way to remove gridlines in Word 2013. While those gridlines can be helpful when creating certain types of documents, they can be distracting for other types. And while Word gridlines won’t print with your document, they can be disruptive enough to your work on the computer screen that they hinder your productivity. Fortunately removing gridlines in Word 2013 only requires you to adjust a single setting, which we will point you to the in the steps below. The steps below will show you how to remove gridlines that are visible in your document. Note that gridline visibility can carry over when you close Word. So the gridlines will either be visible or hidden the next time you open Word based on the setting that we will be modifying below. Step 3: Click the box to the left of Gridlines in the Show section of the ribbon to remove the checkmark. The gridlines should now be gone. Please note that the steps described above will only hide the objects that Word labels as gridlines. 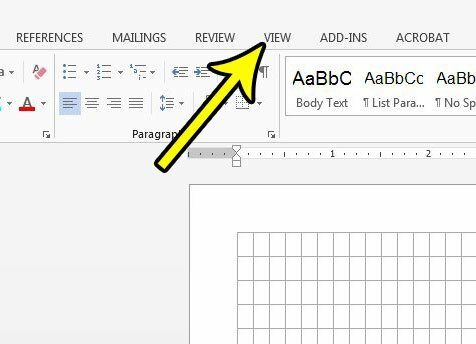 If you complete these steps and are still seeing lines on your document, then it is possible that they were put there via a different method, such as a table. There is a separate tab that appears at the top of Word when you click on a table. This allows you to perform edits on the table’s settings, such as repeating a table header at the top of every page, and will also provide you with an option to hide the table borders.